This book is dedicated to the memory of my beloved brother UNNI, who died of cancer. The talks were given while he resided at our ashram. His inspiring presence and constant encouragement alone made the venture possible. He was Arjuna incarnate, the mighty warrior and hero of many battles in his life, as an air force pilot. At that time he was facing the last and most tremendous battle  the battle for his own life. The indomitable will and stupendous courage with which he confronted this disease was a source of wonder and encouragement to all who were fortunate to be with him. Inscrutable are the ways of God. The cosmic purpose is simple and single-pointed. It aims at the total annihilation of the individual ego in order to attain unity with the Supreme. Through the intricate web and often, bizarre design of our individual existence, this purpose is steadfastly adhered to, even though we may not be aware of it. Very often before we become the egoless and perfect instrument, we have to pass through a cleansing period of an inner evolution, which has to be brought about by an outer and sometimes physical revolution. We find that the aster the evolution, the more violent the revolution which triggers it. The stab of pain is often more potent than the caress of love, to goad the Jiva towards its goal. The more advance the seeker, the more severe the tests he has to undergo. Fortunate indeed are those who are called upon to participate in the hastening of the cosmic purpose like my brother. 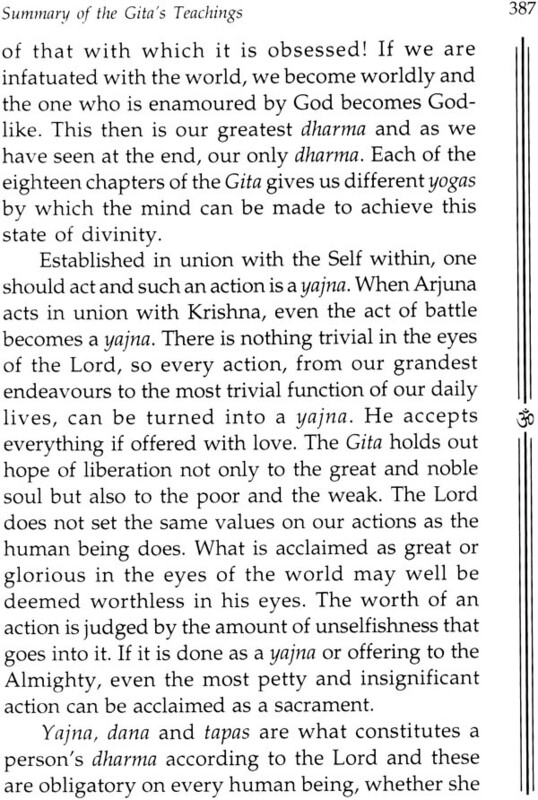 The message of the Gita is addressed to such an ardent spiritual seeker of the Supreme goal. The indomitable spirit in the human being which will not let him rest till the final battle is won and the divine status achieved. In this there is only one thing, which we have to remember that. Life is a drama in which the Eternal Spirit manifests itself as the atman in the human being in order to participate in the marathon race of his own pilgrimage to himself Birth and death are but milestones on the way and all the different bodies one has to inhabit are the guest houses on the road. The different circumstances in which one is placed have to be used as goads to help us in our ascent. We have eternity at our disposal and immortality as our goal and God Himself as our one and only travelling companion. To all such pilgrims and especially to my beloved brother, the invincible warrior who had never been defeated, this book, which is really a yajna, has been dedicated. May the Divine Charioteer guide all of us through the battlefield of Kurukshetra to the Dharmakshetra of immortal bliss. The title has been inspired by my beloved grand-daughter NITYA, who has been in constant communion with Lord Krishna since birth. I aver that those who study this sacred dialogue of ours, will be worshipping Me through the performance of the sacrifice of Knowledge (Jnana Yajna). 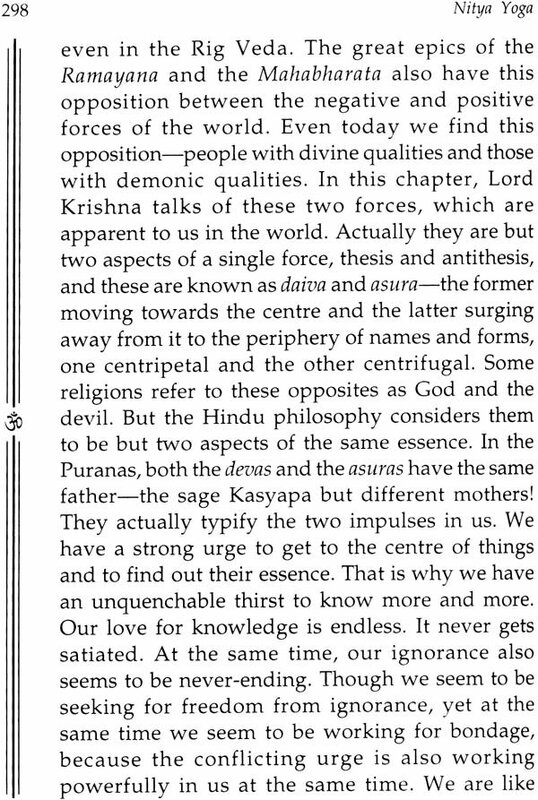 Even those who listen to this (discourse) uncritically and with Full faith, will attain the pure worlds of the righteous, after liberation (from the body). O Arjuna (Partha. Dhananjaya) Have you been listening to this with full concentration? Have your delusion born out of ignorance been destroyed? Aum Sri Krishnaya Paramaatmane Namaha! Salutations to the Charioteer of Arjuna. In India we start everything with a prayer. Whether we are taking a bath or naming a child, whether we are taking our food or going to bed, building a house or looking at the new moon, everything is an act of worship, because everything is imbued with the divine Spirit. Nothing is mundane or common and no act can be relegated to the purely material. In fact, there can be no division between sacred and secular, because everything is sacred. Everything is divine. Everything is permeated and saturated with the divine Spirit. 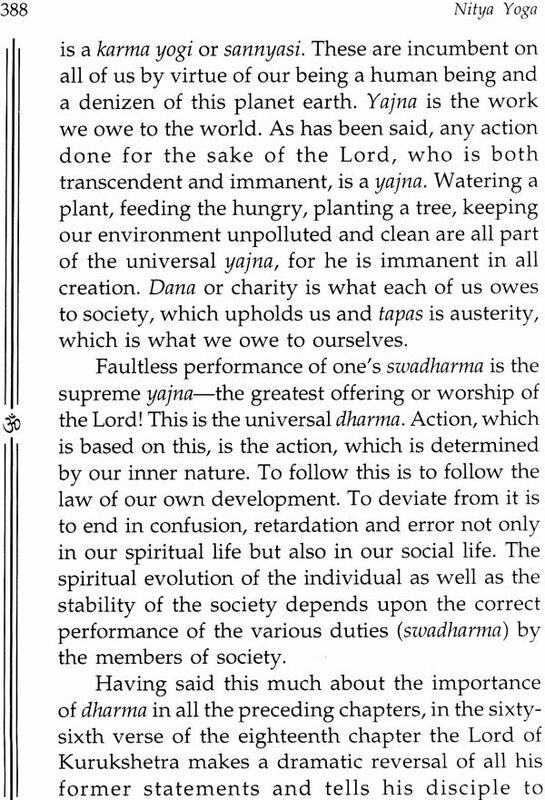 The Upanishads say "Isaavasyamidam sarvam". 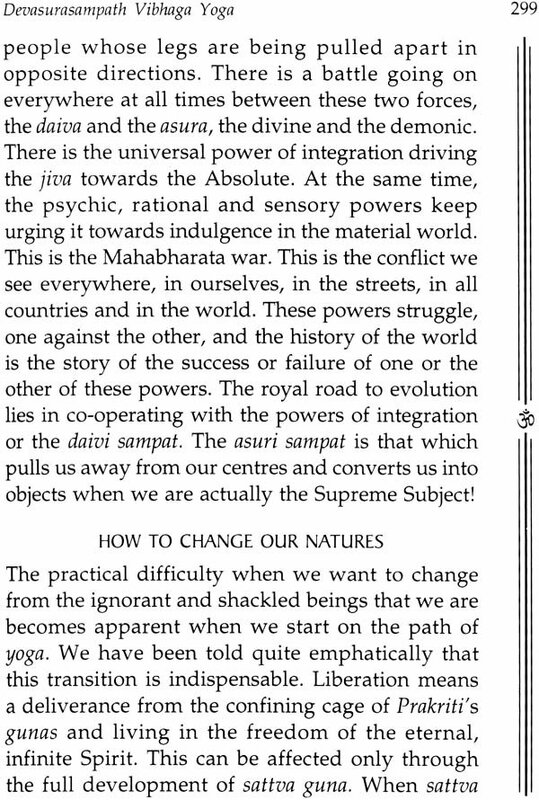 Everything here is nothing but Iswara, the Supreme Lord. We start our study of the Sreemad Bhagavad Gita with a prayer to the book itself  the Bhagavad Gita, which is in the nature of a dialogue between Narayana, the Supreme Soul, and Arjuna, the embodied self, whom He wishes to enlighten. 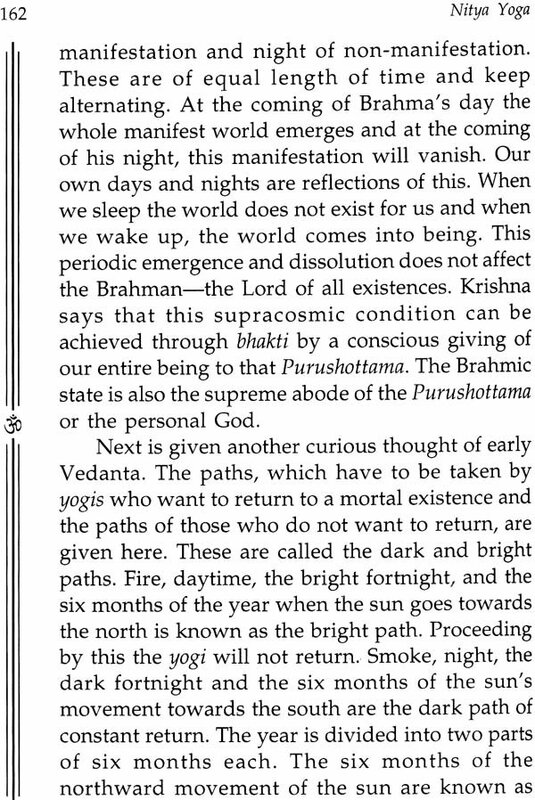 The script was transcribed by no less a personage than Vyasa, an ancient sage, noted for his wisdom. The dialogue occurs in the middle portion of the mighty epic of the Mahabharata and showers on us the nectar of the immortal Advaita philosophy, which dispels the sorrows of mortal existence. Our next obeisance is to Lord Krishna who was God incarnate, the son of Vasudeva, destroyer of evil forces and the preceptor of the whole universe. Therefore, he, Lord Krishna, is the universal Guru. It is because of his grace that we can study this sacred scripture and it is because He is the very stuff of our consciousness that we can understand what is being read. He alone is the narrator and the listener. He permeates and enfolds our entire being. 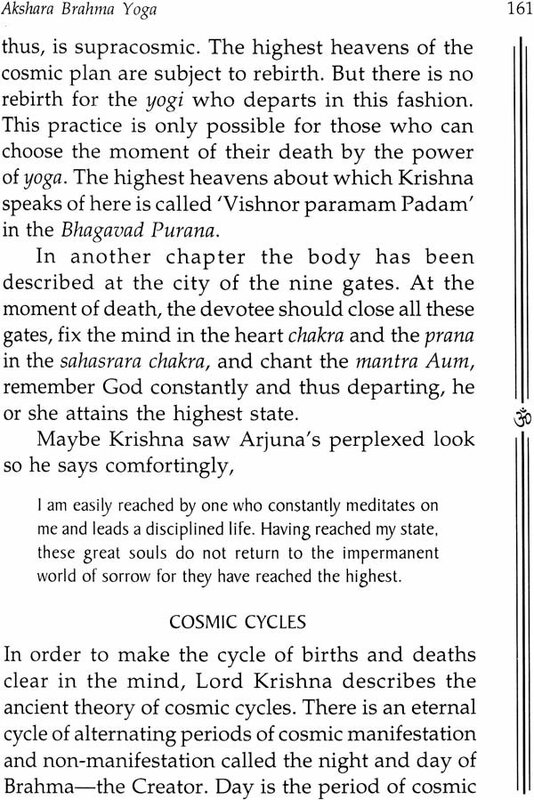 So we begin every chapter with a prayer to Him, the Supreme Consciousness, who enacted the role of Arjuna's charioteer. 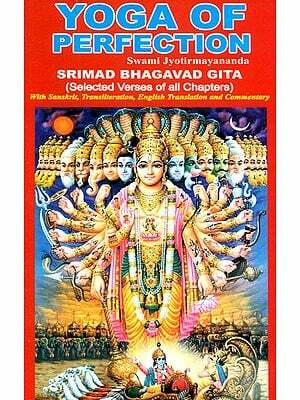 In the following pages we will be studying this book, the Sreemad Bhagavad Gita. Many of us may have heard of it, but before discovering its specific message, it may be good to have some idea of its unique place in the history of religious scriptures. The world abounds with sacred scriptures, revelations, religions, philosophies, sects and schools. The history of religion has been a history of the fanatic clinging of the human mind upon one or other of many creeds to the exclusion of all others. Thus, religion, which should have been a unifying force, became a force or dissension and hatred. All scriptures and all religions are after the same truth. Truth is one and eternal. The human mind from the dawn of civilisation has been seeking it through many different channels. So how does the disparity between religions arise? The act is that this truth though one and eternal, expresses itself in Time and through the mind of man. So every scripture must contain two elements, one temporary and perishable, the other eternal and imperishable, and applicable to all ages and countries. 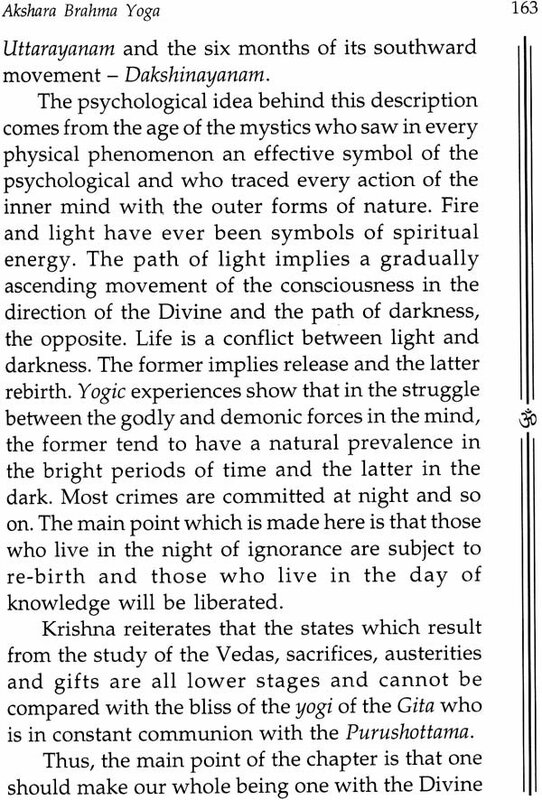 Even though the Bhagavad Gita has a temporal and local setting, its spirit is so profound and universal that its message has been appreciated by all humanity through the ages. 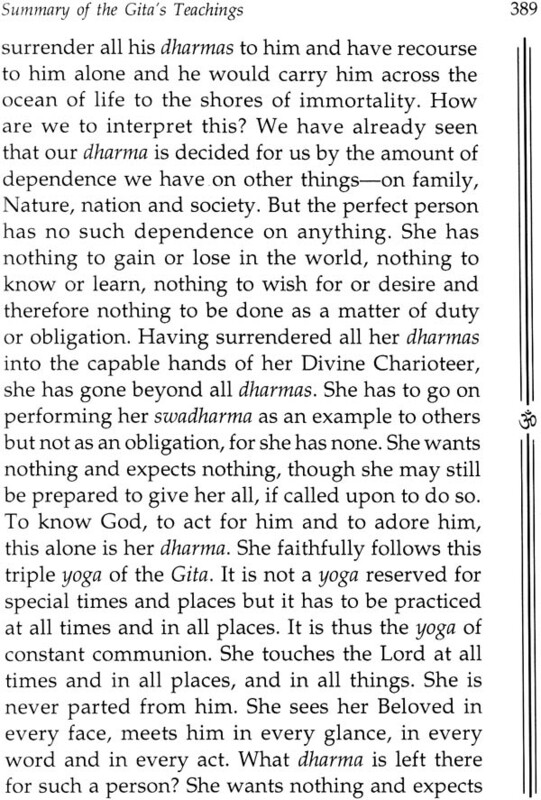 When we compare the Gita, with other great religious books of the world, we find that it does not stand apart as a work by itself, as the message of the spiritual life of an enlightened soul like Christ, Mohammed or the Buddha, nor is it the product of a spiritual age like the Vedas and the Upanishads. It is given as an episode in the epic history of the country called Bharata and arises out of a critical moment in the lie of one of the leading personages in that episode. 1. 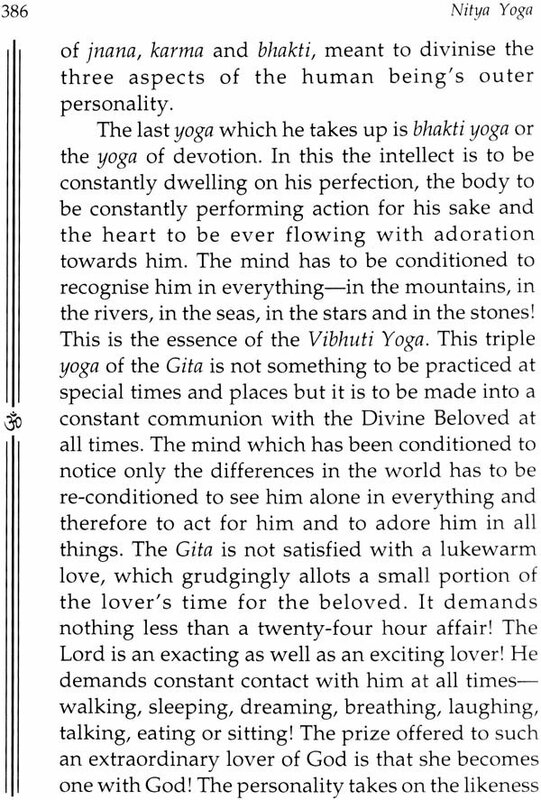 The divine personality of the teacher who was the avatara. 2. 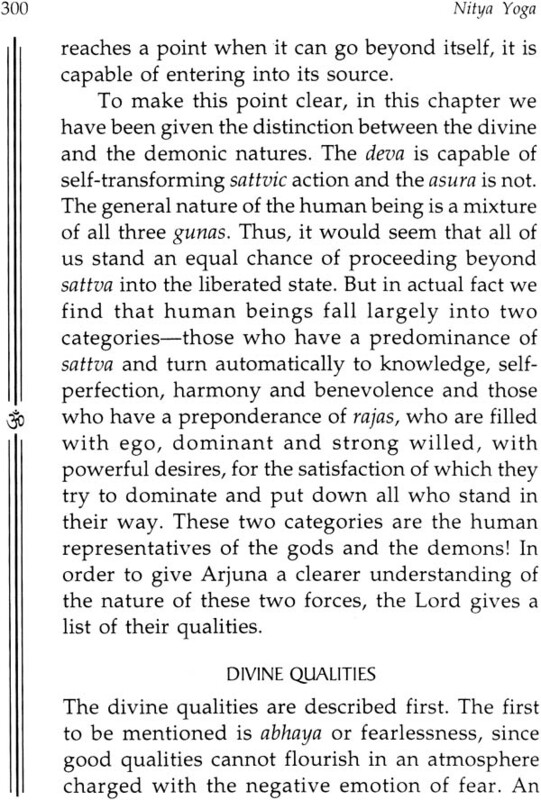 The human dilemma as depicted by Arjuna. 3. The battlefield as the scene of the discourse. An avatara is the descent or revelation of God in human form, which is a firmly held belie in India from ancient times. Though all existence is a manifestation of God, yet it is a veiled manifestation. The avatara however, is a full and conscious descent of the Godhead into the form of a human being in order to aid the ascent of the human to Him. Thus the avatara or God incarnate gives the advice of the Gita. The recipient of the message is Arjuna, the prototype of the struggling human soul who is ready to receive the great knowledge by his close companionship and increasing nearness to the divine Self. 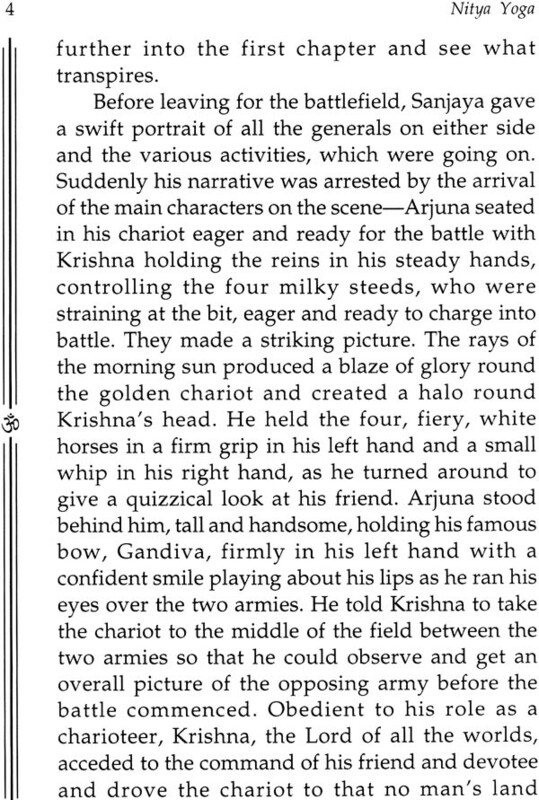 This symbolic companionship of Krishna and Arjuna, the divine and the human soul is further dramatized by the fact that their dialogue takes place amidst the din and clamour of a battlefield. 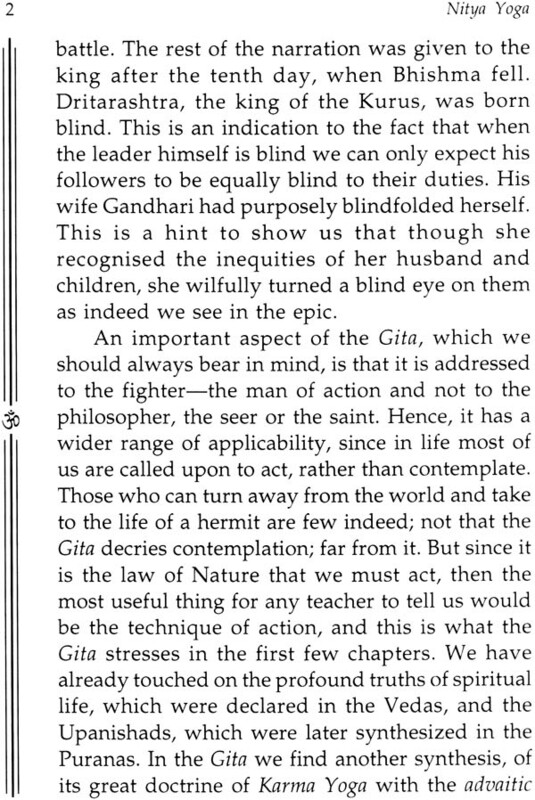 The teacher of the Gita is therefore not only the God who is transcendent but also the God inside us who unveils Himself through our increasing awareness of His proximity. The evolved human begins to understand however dimly that it is that divine immanence which instigates all actions and towards which life travels and progresses. The Divine is at once the secret guide to our actions, the highest source of all our knowledge as well as the closest friend and only relation of all humankind. 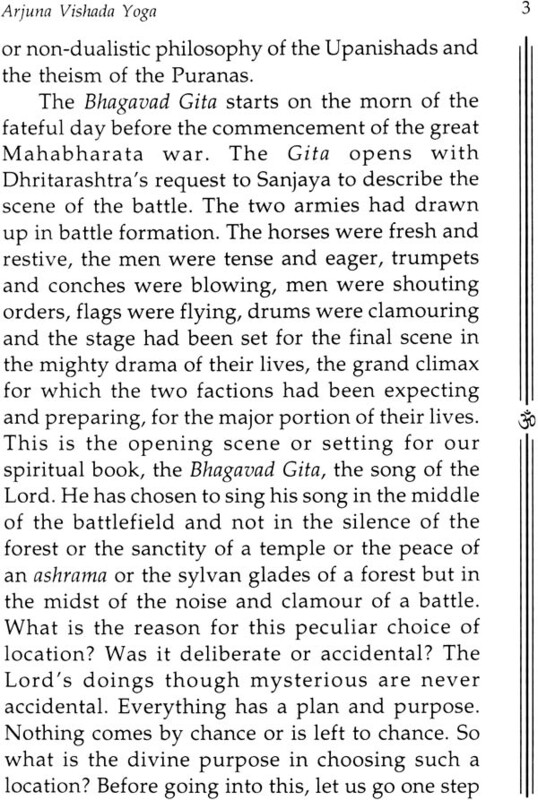 This is why the Gita's message is still as fresh as when it was first given on the battlefield of Kurukshetra, because it is renewable in the personal experience of everyone. The central idea is to reconcile and affect a unity between the inner and the highest spiritual truth in the human being and the cosmos with the outer actualities of our life and action. Thus the greatness of the Gita lies, not merely in being another point of view of a religious outlook but that it is also a guide to each one of us in our day-to-day life. 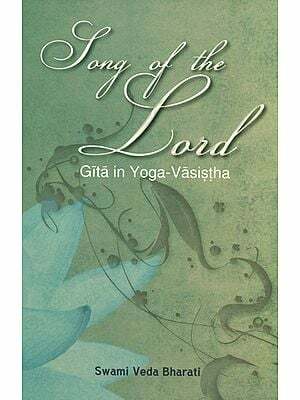 Whatever problems we might have to face in life, whether horrifying or sanctifying whatever the dilemma, it can be solved by the application of the Gita's teaching. 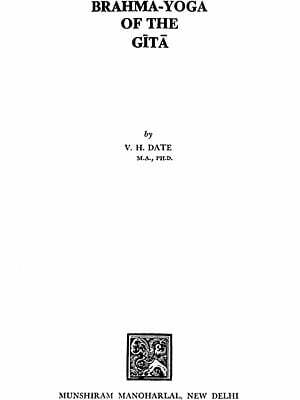 The world has seen many scriptures both sacred and profane, both profound and shallow which men at different times have clung to, as if they and they alone contained the entire truth of life. Time has been the touchstone on which most of them have been tried and found wanting, thus sinking into oblivion. The Bhagavad Gita however has stood the test of time and today more than any other scripture that the world has produced, it has a message for suffering humanity. It brings not just a ray of hope but a burst of blinding sunshine into the dejected mind of humanity which stands upon the brink of a catastrophic war, which it thinks is not of its own making. None of us can claim to be totally innocent, since anything that happens in the world has its roots in the negativity created by all of us. But we are not prepared to accept this and find ourselves projected willy-nilly into a battlefront or which we are totally unprepared. The ready-made answers given by science and technology have failed us. Our youthful dreams of a Utopian society based on love and peace have crumbled to dust. Humanity is aghast to find that the meek scientific robot of its own creation has turned into a veritable monster  a Frankenstein who is ready to gobble up its own maker. And from death to immortality. 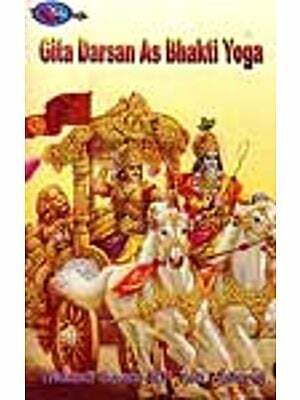 This book is to be treasured by all lovers of Sreemad Bhagavad Gita. 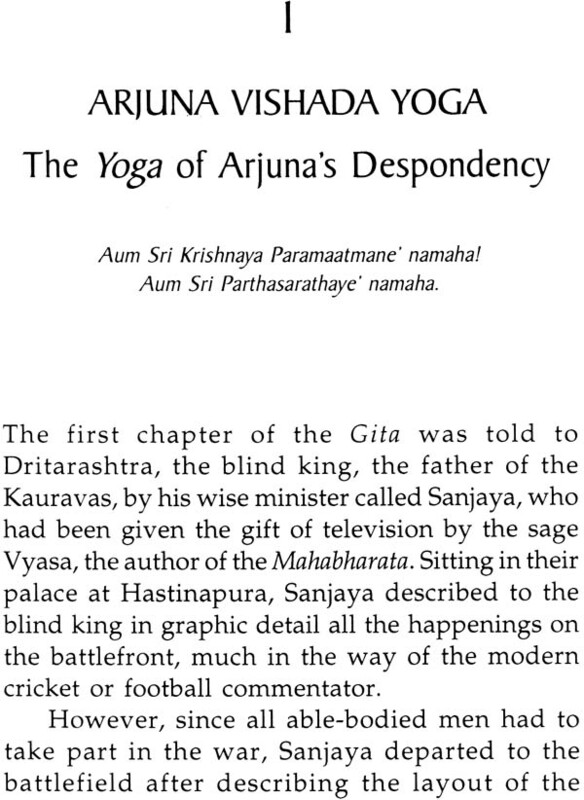 It is a series of discourses on the eighteen chapters of the Gita. It inspires us to live in loving unity and in constant communion with the Divine. This book offers a practical guide to extricate oneself from the pangs of everyday living into the glorious of Life Divine. It gives the correct spiritual solution to every problem by the application of the teachings of Bhagavad Gita. the wielder of the bow, stand united." May the Divine Charioteer guide all of us through the battlefield of Kurukshetra to the Dharamkshetra of immortal bliss!